Spanish guitarist-composer Francisco Tarrega wrote ESTUDIO BRILLANTE in the late 19th Century. This incredibly difficult etude was based on a sonatina by French violinist-composer Jean-Delphin Alard. In addition to Tarrega’s performing and teaching ability, he also arranged many pre-existing works for guitar by composers such as; Beethoven, Mendelssohn, and Chopin. Even though he only wrote less than a hundred pieces for the guitar, the short compositions are enjoyed by many guitarists. Within the music world, many consider Tarrega to be an important founding figure for the classical guitar genre. Other works by Tarrega include how most famous work, RECUERDOS DE LA ALHAMBRA, and LAGRIMA, a popular guitar tab for beginners. Your free download of ESTUDIO BRILLANTE includes an interactive Guitar Guru Session plus free printable guitar tab, and is available through October 31st. Download your free guitar tab and Guitar Guru Session for ESTUDIO BRILLANT today. For more recommendations on classical pieces for guitar, we recommend browsing our selection of classical guitar tab. From now until the end of October, comment on this blog post for your chance to win a Guitar Guru headset. To enter, all you have to do is comment below telling us about the song that you had the most fun learning how to play. What can you do with your Guitar Guru headset? From learning how to play songs from The Beatles Rock Band to our new features in Guitar Guru 3.0, a headset enhances your overall guitar song learning experience. Guitar Guru features voice command functionality for the PC, so using a headset allows you to keep your hands on your guitar while you’re learning how to play your song. We tested a bunch of different headsets for Guitar Guru yet one stood out among all the brands we tested. 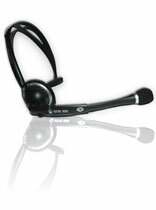 This Plantronics headset offers noise-canceling, excellent sound quality, and has a retail value of $24.95. Be sure to comment on this post for your chance to win! Contest ends midnight on October 31st. Limited to one entry per customer. One lucky winner will be contacted via email by November 2nd, 2009, so be sure to provide a valid email address in the comment field. We respect your privacy, and will not use your email address for any other purpose than this contest. The most fun song I learned to play was my firs to sound like a real song and that was the all time favorite of Rock Around the Clock. The most memorable song I have learned is Carried to the table and is still one that touches my heart every time I play it and hear it. I would be inspiring to learn to play the music of Mr Tarrega . The download and the head set would be a wonderfully helpful tool. I am currently taking college level guitar lessons and am looking forward to improving and being able to share this music with others. I’ve actually forgotten the song title, because it was over 30 years ago. It wasn’t the first song I learnt at school guitar lessons, but it was th efirst that was a bit more modern and upbeat. But mainly it had an (open) F chord in it, and at the time, holding down 2 strings with 1 finger, was like magic. Eventuall I mastered it without fret buzz and my general fear reduced. Until I got to (open) B of course. LOL. I think the song was either where have all the flowers gone (may not be the song title but a line) or Oob la Dee (ditto). So not my first challenge, but my best challenge solved. It’s great when you accomplish something that isn’t instantly easy. It’s nice to see you giving away a Spanish tune for guitar but couldn’t you have started with something a bit easier? This tune is rock hard. What song did I have most fun learning to play? I really like Debussy’s Clair de Lune as it isn’t too difficult but still sounds great. What tune did I have least fun learning to play? Beethoveen’s Moonlight Sonata. It sounds good but it’s a real struggle. 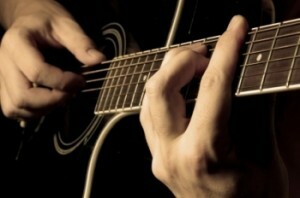 The level of difficulty for our free guitar tab and Guru Session will vary from month to month. Be sure to check out our free sheet music for other free tab, too. For this song, we also offer a corresponding song lesson to help you learn how to play it. If you’re not familiar with our software, we invite you to check out our Guitar Guru Sessions page. Thanks for your feedback and your entry into our contest! Thanks for your reply. I do check the free music every month. My favourites were from last year – Tchaikovsky’s Nutcracker meddley and In the Hall of the Mountain King by Grieg. Those classical pieces sound great on acoustic guitar. As a starter piece for Spanish guitar, I think that Malaguena is a good piece. I see that you don’t have a tabbed out version of this on musicnotes yet. I enjoyed learning Bach’s Partita #2 most of all! I just started play guitar and have found this site. It has helped me learn new notes and how to play them. I look forward to a long relationship with this site.